Oxford researchers think they have what amounts to next-generation eyeglasses — basically, these are spectacles embedded with cameras mounted inline. And yet, that’s exactly what scientists are working on. Not only is a camera integrated along the edge of the frames, but in this implementation, lights also dot the surface of the lenses as well. My first thought is “Eeshk.” I’m usually so glued to some sort of screen that I actually look forward to natural, organic vision (like looking at a tree out in the distance… or even my cat chewing on my high heels, which is sadly what I tend to see). The point is, in this gadget-driven age we live in, most of need to give our eyes a tech break — not find more ways to soak them in circuitry. Uh-oh — another Star Trek reference is bubbling up. 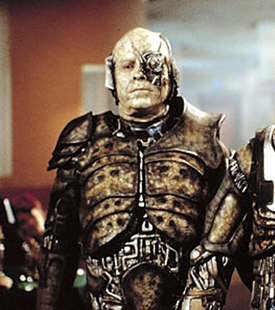 Suddenly, I’m secretly wondering if we’re not all turning into the Borg. Um, okay, mebbe not. In fact, when I look into this further, the concept isn’t as wild as it seems on the surface. This approach would actually benefit people afflicted with macular degeneration, giving them a new, albeit simplified, vision of their environment. 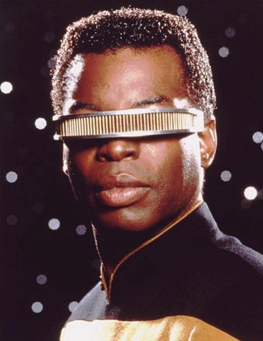 But who could make hi-tech glasses like this without at least a few sci-fi, Borg-like features? So there’s also facial recognition, tracking software, position detectors and depth sensors. 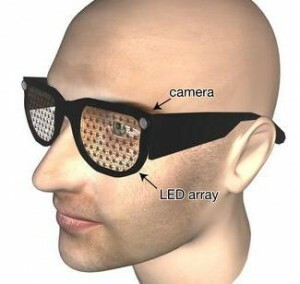 Another set of glasses in development by MIT and the University of Cambridge also features a micro camera — except this time, it has an integrated computer that reads human expressions. A negative or positive emotional response, indicated by certain physical traits, will signal a flash of light in either green or red (respectively), viewable only by the wearer. And snap, just like that, I got it. This one point hit home for me, since both my parents have really poor eyesight and another relative has Asperger’s, a form of autism that makes it very difficult for him to read other people’s emotions. I can see how something like this could be really useful for all of them — not as some sort of cool futuristic tech, but as a real-life, “right-now” sort of tool that can help them in everyday situations. So suddenly, the future just can’t get here fast enough. If you were to redesign the consumer eyeglass of the future, what would you put in there? Proximity sensors? Augmented reality software? How about cameras with actual still or video capture, or zoom capabilities? And let’s get this out of the way — there are at least a few of you secretly longing for X-ray technology, no? Share your best practical (or fantastical) concepts below.